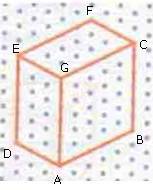 Draw a cuboid of dimensions 5 units x 3 units x 6 units on an isometric dot sheet. 1. First take an isometric dot sheet. 2. Draw the line segment AB and AD of length 5 units and 3 units respectively. 3. For the height draw the line segment AG, BC and DE of 6 units each. 4. Join EG and GC. 5. Again draw EF and CF of 5 units and 3 units respectively.